Well, I couldn't pass these on eBay. I'm looking at making a fixture for these, but I don't seem to have any good ideas. I'm looking for something that is simple, portable, functional, safe and beautiful (decorative). It must also enclose the lamp completely. For a yet-to-be-purchased ballast, would this require a C156 ballast ? That's what I think but I am not completely sure. Thanks to everyone who makes suggestions ! Yep cool little lamp, I have 2 of these myself and the Ballast but unable to light mine as I don't have a Lampholder / fitting for them. 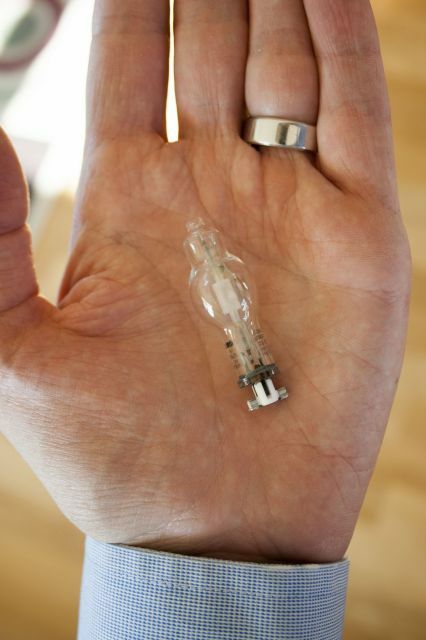 I have a normal 20w CMH ballast and one of these lamps. the ballast runs it just fine. Thanks for the input. I only have the lamps (I purchased two) so I will have to get a proper ballast and lamp holder. Is a lamp like this as bright as a standard 100 watt incandescent ? Yep these lamps give 1650 lumens, slightly brighter than a 100w Filament lamp. (240v 100w Coiled Coil Filament Lamp gives 1360 lumens). I got like 6 cases of these at restore. I have one too...a "dinky" little thing! Has anyone of you ever made a fixture for a lamp like this ? This lamp intended mainly for tracklights. So small, but it costs $ 200 here in Brazil. USD $ or Real ? And the lamps and ballasts are easy to find, it's the socket that is impossible to locate.. I bought a socket on eBay a while back, takes a long time to come as it ships from China. I never got around to anything further other than getting said socket. Despite the 20W name, these lamps are actually rated 22W and should be used with a C175 ballast.